Okay, I’ll be really quick on this review, because I want to jump on this series and since they told the more the series advance, the better it gets... well, I want to read this the fast as I can. I’m usually not the biggest fan of horror stories (basically because I’m a chicken) but I’ve got to say that I was seriously missing out on this books. Karina Halle is a hell of a horror genius. So Perry is a 22 years old, bored with her life and with no idea what to do. One night, when spending a weekend in her uncle’s farm she decides to go see the lighthouse that the farm has. She immediately understands that there’s something wrong there. Something that she’s not even sure it’s real. 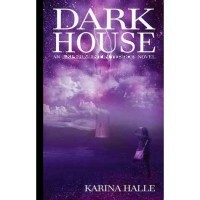 In the lighthouse she meets Dex, the cameraman of some webcast tv-shows and long story short, she ends up doing a test show for an online tv-show of ghost hunting. Dex has some secrets, she has also secrets in her past and they both have a lot to learn from each other in order to stay alive in the end. Okay, this was pretty good. Perry was probably the female heroine with whom I had identified the most. Without the whole ghost hunting thing, because let’s face it... I’m too chicken to ever do something like that. Dex was also awesome and their chemistry was out of the charts. I'm really anxious to see what will happens next.